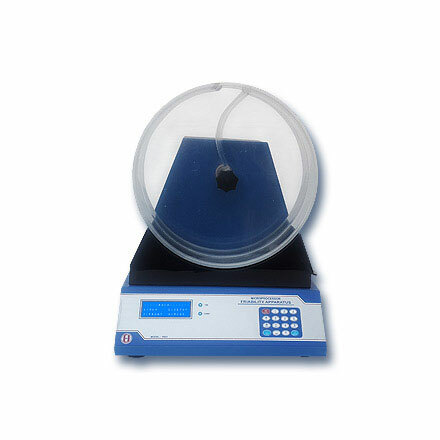 Friability Test Apparatus | products Categories | Electronics India - Manufacturer, Supplier and Exporter of Analytical, Scientific Laboratory and Pharmaceautical Instruments in India. Electronics India is renowned as a important manufacturer and supplier of hi-tech instruments used in the pharmaceutical industries, institutions and research laboratories. 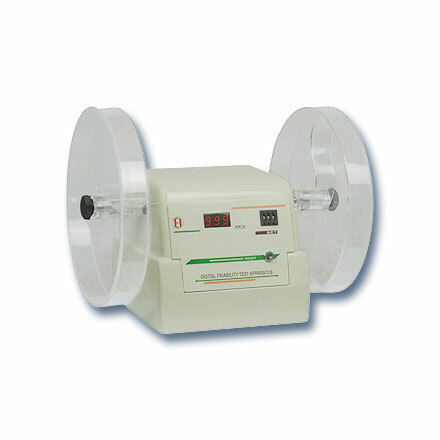 We are well established Friability Test Apparatus manufacturers, supplier and exporters from India since many years. Company's Digital Friability Test Apparatus is a precision instrument for measuring obression strength of the tablets. The Friability Test Apparatus is designed as per IP/USP standards. The unit is equipped with two transparent acrylic drums which rotate at a speed of 25 .1 rpm. Each of the two acrylic drums are provided with an arm which carries the tablets along with it up to a predetermined height and allows them to fall from that specified height, while the drums are rotating. It is fitted with a digital revolution counter showing the current number of revolutions for the test. A thumb wheel switch is used to set the desired number of rotations. Provision is made to remove the lid of the acrylic drum by unscrewing just one knob. This is available in 1 drum and 2 drum assemblies.